Ico takes an interesting stance on the princess story by flipping it around - putting the rescue first, and instead placing focus on the escape. Unfortunately, the princess in question, Yorda, is about as helpless as they come. You literally have to take her by the hand and lead her through the entire game. She treats malevolent shadow beasts from the dark beyond with benign curiosity and responds to attempted abductions with all the ferocity of a bemused kitten. Despite this, Yorda manages to convey a surprising depth of character: It's impossible to lead someone around a doom fortress for hours on end without forming an opinion about them. Whether you despise her incapability or admire her serenity, you spare more thought for Yorda than you ever would for Peach or Zelda, simply because she's there. Her inner strength is also revealed towards the resolution, when you are rendered helpless and she becomes the rescuer. In the end, we tolerate Yorda's fundamental uselessness because it's an essential aspect of gameplay - although that's unlikely to be a comforting thought when she's being sucked into a vortex while you're dangling from the ceiling half a room away. In spite of all this, rescuing the princess is never going to go out of style. There's something incredibly cathartic about bashing down a castle door and charging in on a stormy steed with your sword drawn and a battle cry on your lips. Princesses give us a reason to do that, and, regardless of how bland and passive they might be, they add a little human connection to our quest. In a world without princesses, every fantasy-based RPG would have you traipsing up Mount Peril in search of a stolen magical crystal. And if there's one thing worse than princesses, it's crystals. Yet an alternative image of Princess Peach gives us a glimpse of how the Princess can evolve. In Super Paper Mario, Peach is not only given dialogue and a personality, but is also included as a playable character. Rather than sitting around in a dark tower waiting to be rescued, she joins up with Mario and Bowser and shares the adventure. Because Peach influences the plot, rather than simply being the plot, she is finally revealed as a dynamic and interesting character. It is one of the precious few instances where a princess has been done well. Peach's witty exchanges with Bowser are both funny and endearing, and her range of useful abilities makes her a character in which the player can invest. 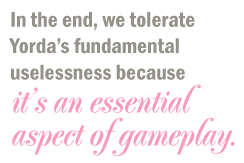 When Peach is kidnapped or incapacitated, her loss is felt by both the party and the player, reminding us that, while we may not need to rescue princesses, sometimes we want to. Alfie Simpson is a writer and poet. He once rescued a countess, who actually turned out to be quite likeable.